Fitness app RunKeeper has introduced advertising to its app, which has grown to more than 34 million users around the world. 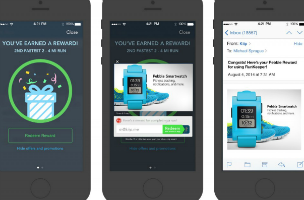 This advertising serves a rewarding function for the app’s community, as RunKeeper’s partnership with mobile rewards platform Kiip will see users offered rewards, powered by Kiip, to congratulate them on their progress and achievements. In this way, RunKeeper hopes to offer even more motivation to users to reach their goals. These rewards are for fitness-based or otherwise healthy products, and may include free product samples from companies including Pebble, Proper Fitness Water, Quaker Oats or P&G Secret Deodorant. Users may also be rewarded with free sponsored song downloads they can utilize during future workouts. In RunKeeper, users can enter their own goals, like running a certain distance, finishing a race, or losing a specific amount of weight. The app uses GPS tracking to help users complete their running routes, or can simply be used as a tracker of burnt calories, distance run, running speed and so on (even without an established route). Users can sign up with Facebook to share their progress with friends, and can also automatically track long-distance walking with the app’s Pocket Track feature. This sees the app tracking any walk that lasts at least 15 minutes, without actually being opened and told to do so. That is, the app will track these walks while the app is closed, and will notify users of their progress once they come back to the app. Pocket Track can be turned on or off in the app’s menu. Users can test this new reward system, or simply try out RunKeeper, on both iOS and Android. The app is available to download for free. Going forward, Kiip will pursue additional opportunities with RunKeeper, for implementation on other connected devices, like smartwatches, smart scales and more.